The first Indonesian language and culture class to take place in Nottingham has ended with a visit from the country’s Education and Culture Attaché. 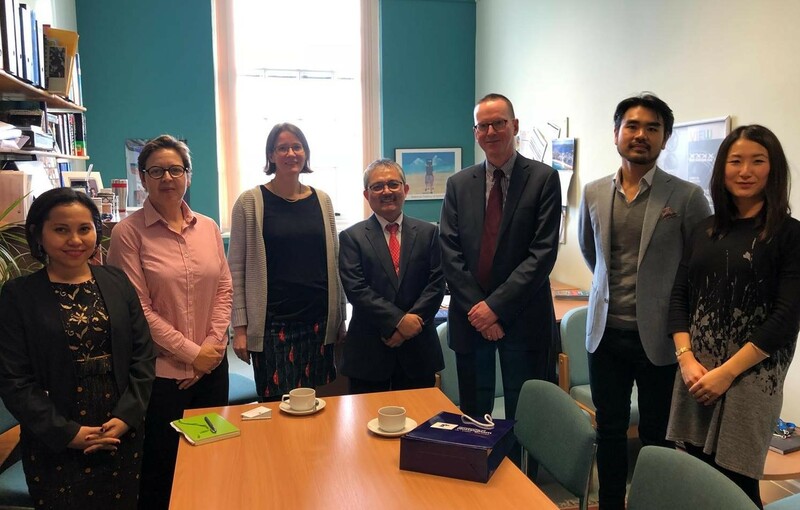 Professor E Aminudin Aziz from the Embassy of Republic of Indonesia was invited to Nottingham to discuss future opportunities for Indonesian language classes and cultural programmes following the success of the three-month scheme. During his visit, the Attaché stressed the importance of collaborations in education and culture as well as fostering new friendships and appreciation among the students, staff and the general public. Indonesian culture has long been celebrated among University staff and students in its three campuses. Meeting with Professor Nicola McLelland and Dr Oranna Speicher, Director of the Language Centre at the School of Cultures, Languages and Area Studies furthered the commitment from both sides to continue the Indonesian language scheme at the University. A lunch networking session with colleagues from Asia Research Institute and representatives from the Indonesian Students Association (PPI Nottingham) and the Indonesian Student Society highlighted the benefits of engaging collaboratively and creatively. Addressing students, the Attaché reflected on the role and responsibility of Indonesian students; explaining that the high level of support and guidance offered by the Embassy was instrumental in ensuring the Indonesian student community in the UK had a positive education experience. Nottingham has recently strengthened its tie with Indonesia through partnership with Ministry of Research, Technology and Higher Education. An Indonesia Doctoral Training Partnership was launched which demonstrated shared vision and commitment with the Indonesian government to foster a new generation of scholars to tackle world challenges.